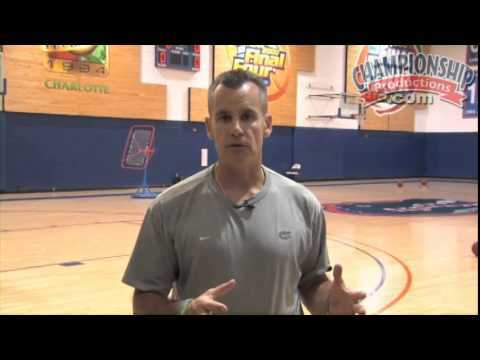 Florida Gator Strength and Conditioning Coach Preston Greene delivers a comprehensive dynamic stretching and warm-up segment that incorporates the lane running drill and an intense agility ladder workout that takes players directly into defensive slides. Players are taken through various close-out and defensive footwork drills designed to improve the athlete's ability to force, pressure and contain the basketball. These drills require physical and mental toughness and stamina. Coach Greene wraps up the conditioning portion by taking two Gator players through an intense weight training session that features 10 exercises performed with maximum effort and pace. Coach Donovan takes the floor and leads his players through a fast paced series of shooting and attacking drills. Donovan starts with the Gator guards, as they perform transition shooting drills and dribble moves. He also demonstrates his "shoot and move" series where he emphasizes quickly getting set up to shoot by beating the ball to various spots on the floor. Donovan delivers the same drill intensity with the post players as he progresses from backboard tips and Mikan drills to various 1-on-1 catch and score drills. Utilizing heavy basketballs and toss-backs, Donovan forces players to compete in each competitive drill. This exhaustive post workout concludes with game-like pick-and-roll and live 2-on-2 post up drills. What makes this All Access skill development DVD unique is that Donovan provides extensive game highlight footage in between drills demonstrating the relevance of each competitive drill. Donovan explains and demonstrates individual defense as he works in groups of two and four players, working first with the perimeter players and then the post players. Donovan covers all areas of defense ranging from stance and slide technique to help and exchange and ball screen responsibilities. He places emphasis on discouraging the drive, yet taking away the three point shot in all of his competitive defense drills. Donovan adds his competitive twist to learning how to handle screens by incorporating 2-on-2 live as players learn to defend down screens and back screens. 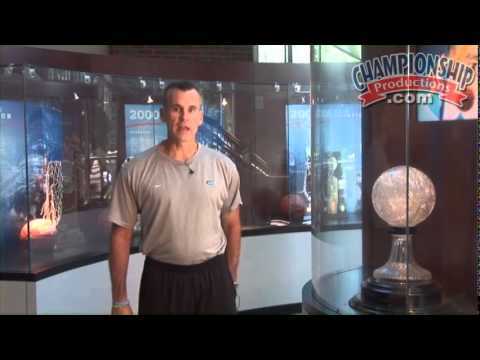 He concludes the defensive segment by teaching how to defend the most prevalent play in the game, the ball screen. Uncover the basketball drills and techniques that have taken the Florida Gators to the NCAA championship platform and sent many Gator players to the NBA. 253 minutes (3 DVDs). 2011.